Stonehill offers offer a series of campus visit events during the summer, including Academic Preview Days and General Visit Options. Want to learn more about Stonehill? Join our mailing list to receive invitations to campus events and brochures highlighting the amazing programs Stonehill has to offer. The first year of college can be tough: challenging coursework, plus a whole new environment, new people and new routines. It can be tough…unless you’ve met and mastered far bigger challenges. That was the case for Evaudie Paul ’20. Originally from Haiti, she survived the 2010 earthquake that devastated that country, killing 300,000 people. Then, following her parents’ divorce, she relocated to Brockton in 2013—a city where she knew no one and didn’t speak the language. Paul brought that same drive to her studies at Brockton High School. “I always wanted to do great in school, and my teachers were very supportive of me,” she continues. And no doubt they had a great pupil: Paul graduated with a 4.1 grade point average. Outside of school, that drive led her to become certified as an interpreter, a skill she used to help other Haitians acclimate. She began interning as a translator at Brockton Neighborhood Health Center community clinic. “Being a bridge between the patient and the doctor gave me new understanding,” she notes. The job also served as a window into what Paul hopes is her future profession: medicine. 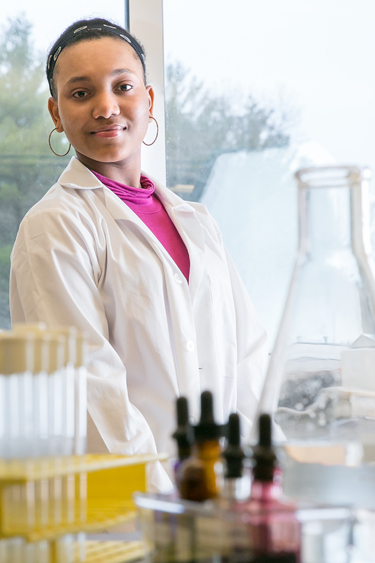 Today, Paul is a biochemistry major and reports working “very hard” in her classes. “My priority is my studies,” she says. But by no means does that make her one-dimensional. Paul has a part-time job on campus, working as an office assistant in the Summer@Stonehill Pre-College Program, a selective college-credit bearing experience for rising high school juniors and seniors and graduating seniors. She joined the Distributive Education Clubs of America. “We work on things like interviewing and public speaking,” she says. Through Think. Act. Lead., the College’s comprehensive mentorship program, Paul has attended seminars on leadership and time management. “In January, they held a career planning conference, where graduates came to speak about all different fields. I met a physician assistant there who invited me to watch a surgical procedure,” she says. Looking back now, Paul says she is confident she made the right decision. “The professors at Stonehill are wonderful. They always have time for you. 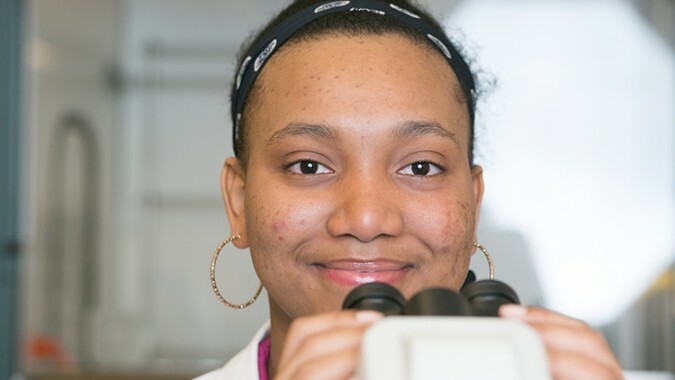 And there are so many opportunities here.” She was disappointed, however, to learn that one of those opportunities, SURE (Stonehill Undergraduate Research Experience), is open only to rising juniors and seniors, as she thinks rising sophomores could use SURE to see if they are interested in research. 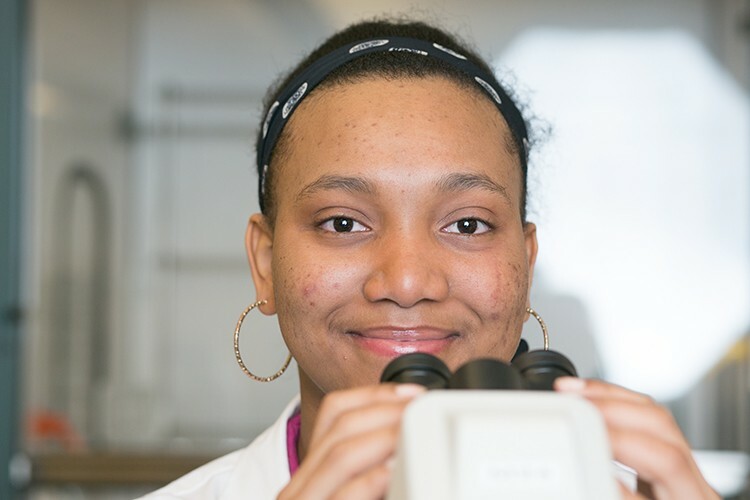 But it takes more than that to hold Paul back: She’s applied to take part in a summer research program at UMass Medical School in Worcester. She also hopes to make a trip to Haiti this summer, her first since emigrating. “I miss my family and my friends,” Paul says. “My dad and my two older sisters are in Haiti. I think—I hope—there will be time during the summer, so I can go.” One thing is for sure: If there’s a way to make it work, Evaudie Paul will find it. To read the Boston Globe article featuring Evaudie, visit here.